This is a three-track affair clocking in at just over 45 minutes, maybe indicating how Goatspalm approach their musical leanings, without actually having to press play. Thundering cavernous Black Ambient is the foundation to ‘Utuk-Xul’, with guttural sniping vocalisations and feedback driven open chord guitars. Oppressive and visceral without overstating itself too much, this opens up mid way, rising at the necessary point in which you are feeling yourself being dragged down too far into the mire, paving your way for an easier transition through this twenty minute-long journey. 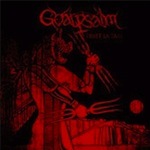 ‘Bab-Illu’ by Goatspalm’s standards is barely a track at all, coming to completion at just under six minutes. However this is a different slant from its opening bigger brother, with rich dark, breathing ambience, complimented with eastern guitar work. ‘Under the Trident of Rammaru’ once again beds in on the Dark Ambient scale, flirting with blistering Black Metal overtones that crash through when least expected, culminating into an early horror film soundtrack like ending. Overall this is a solid, competent release that should appeal to listeners of Black Metal and Dark Ambient, reminding me somewhat of the earlier works of MZ412, or indeed Goatvagr. With a little more attention vocal wise, to stick with high-pitched screams over lower ranges and more reverb on the grinding guitars, the nightmarish sounds on offer would be ultimately more epic.